Instagram Hashtags: in the Caption or Comments? 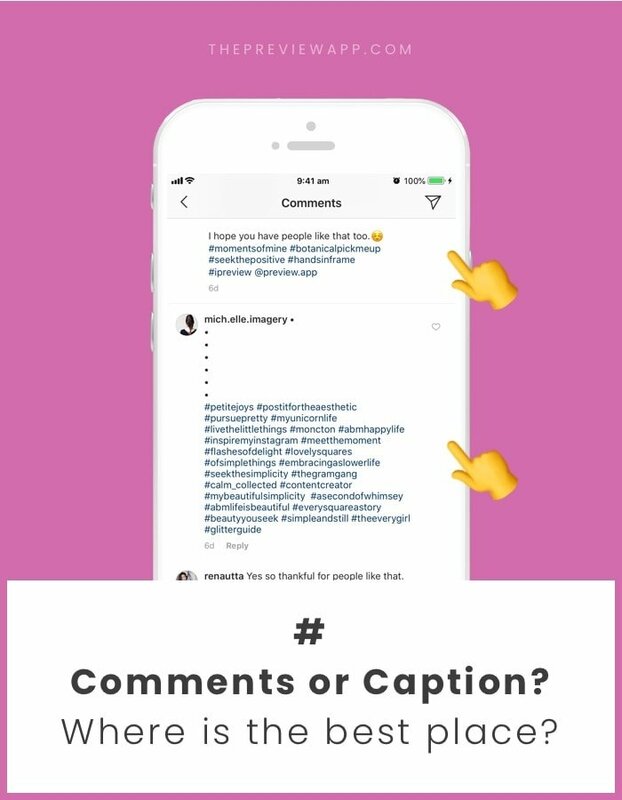 Instagram hashtags: Should you put them in the caption or in the comments? Is it normal to keep the hashtags the caption? Why do people put their hashtags in the comments? 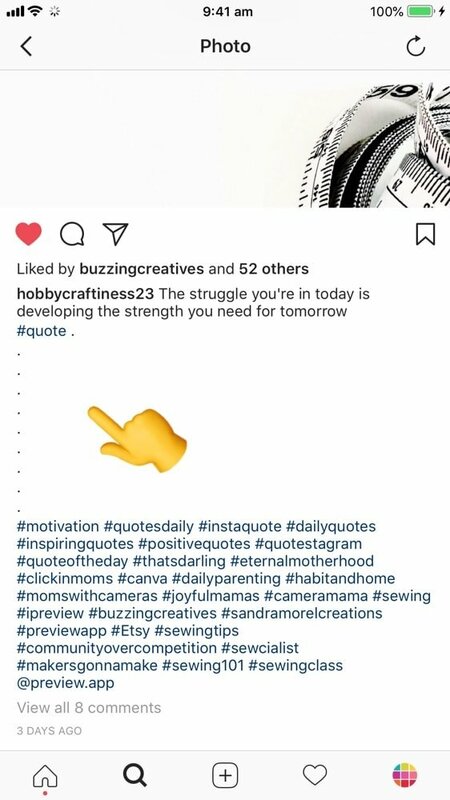 Do you get more engagement if you put hashtags in the caption or comments? Do you get shadowbanned if you put them in the comments? Can we once and for all put this debate to rest? As far as we know, Instagram itself has not revealed how the algorithm works and has not made a statement about hashtags. So the best way to answer these questions is by asking Instagrammers themselves – YOU! A few days ago, we asked you on Instagram to share your personal and professional experience. We made a post on our feed and did polls in our Insta Stories. In your experience, do you get more engagement depending on where you put your hashtags? Let’s have a look at the comments on our post. There are more than 200 comments so we selected as many as possible to feature on this blog post. All comments are very interesting and give a good perspective on the pros and cons for each. Quick summary: Most people put their hashtags in the comments because they want to keep their captions “clean”. They found that it didn’t matter where they put their hashtags, so the comments section is their preferred option in order to keep their captions “clean”. Flippingthruthepages: I don’t see any particular difference [between between putting them in the caption or comments]. I usually put them in comments so that my post looks neater. Renscribbles: I am leaving the caption neat so followers don’t get annoyed with too much hashtags. So I put them along together with the comments. Allofthesefoods: I put them in the comments because I think they detract attention from what I’m trying to say! Labelle.miche: In the comments it’s looks cleaner. Abayaandheels: I put them in comments for aesthetic reason! I don’t like to see them under the pict! But that’s the only reason. Ainaazweerahussin: In first comment because you can spare for long caption and not look messy mix each other. And if I don’t have any idea for caption I will put hashtag at caption. 13reanna13aker: Having a huge list of hashtags in the caption can be a visual distraction. To increase user-experience, put them in the comments. The post will still be searchable by hashtags & people are more likely to comment on posts that already show a number of comments. Even though it’s not a “real” comment, it’s a good welcoming signal to draw in those first few comments. I’ve even had people reply to the hashtag list comment! 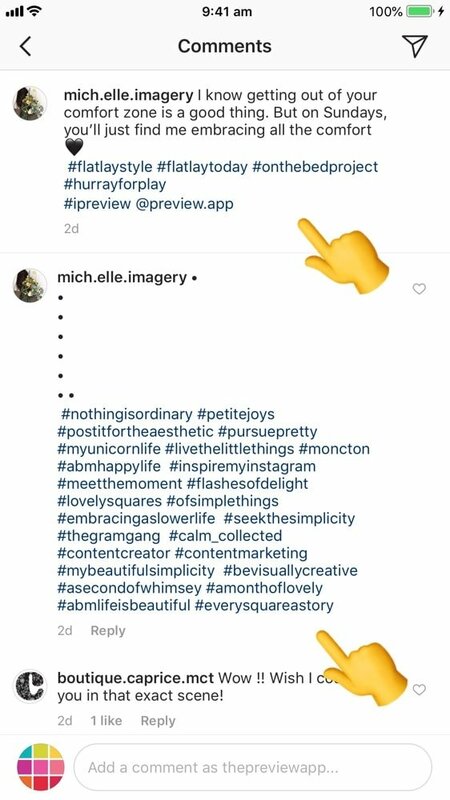 The.vidzmak: I agree with @mich.elle.imagery 😊 I don’t want my followers to get frustrated with that whole bundle of hashtags. According to me, it doesn’t make any difference because even if I put those in comments, it gets a good number of impressions… Sometimes 19 or so… According to the hashtags I use. Liveloveruntravel: I have been splitting them into a few comments and was going really well with it. My posts were seen by anywhere from 20-40% of people who weren’t following me. Then about a week and a half ago it dropped. Maybe 10-40 people were seeing them from hashtags. Yesterday I put them all together in one comment and I seemed to get a lot more immediate engagement although it still hasn’t been seen by that many people from hashtags. I may try the caption just to see if it makes a difference. _olivia_fga: During a long time I posted in the comment section. Now I try to put them in the caption (since 3-4 weeks) and I lose 30% of my engagement ! Ashton.p.hall: Definitely better engagement in the caption, but it looks way too messy so I always put them in the comments. Hmmm… interesting this last comment about engagement… Let’s look at what team “caption” has to say. Quick summary: Most people put their hashtags in the caption because they get more engagement OR they want to avoid the “Instagram shadowban”. 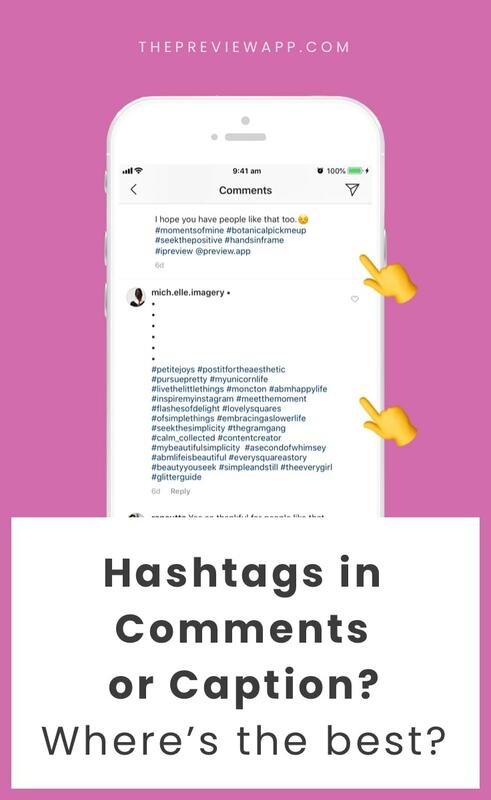 People who put hashtags in the caption also like to separate the hashtags from the rest of the caption by using full stops (keep scrolling to see some examples). Gusgusinthecity: I’ve heard that you should put them in the caption but I don’t really know what’s true anymore!!! but that’s what I do. Jaimesays: Better engagement when I put them in the caption. Min0ribiy0ri: I tried hashtags in the comments but had a significant drop in likes. I put it back in the caption and likes went back to normal. Endee.hq: Personally I have noticed that no hashtags in caption and all in comments got me way way less engagement.. Dividing fairly between the two got me little better numbers than the first, but ALL tags in captions get the highest engagement always. Danielleplgmkrs: I #always use #hashtags #organic in my #writing. Plus add some more in the end. Tegan_d: I always use hashtags in the caption section so that I can add them or edit them as time goes on. I don’t think i can edit them in the comments. Medleythink: I tried both and did not see any difference in engagement. On the other hand from visual side I prefer having them in caption divided by several dots because they feel distracting in comments. Nordiccopperdesign: I’ve tried both. At first I had them in the first comment. Neater look and better for posting automatically to FB. As engagement has dropped, I’ve experimented with leaving them in the caption. I don’t notice any difference. It’s most of all the image that determines engagement. Katfishcreations: I’ve always added Hashtags with the post. Anytime I’ve ever tried to make a comment after posting, Instagram does not allow me to do that. I don’t know why I’m not allowed to make a comment on my posts. Bridgettharrison_hair_mua: When I learned about putting hashtags in the comments I did it with both of my accounts. Now with both accounts I was placed in the top on the explore page also my likes totally went up. Then on my personal page I started to notice I wasn’t getting any engagement and after researching I found out my page had been shadow banned 😖. Now at the same time my business page wasn’t having any issues. To be on the safe side I started back putting my comments in my caption. It took about two months for the shadowban to go away. Suebzimmerman: On my biz acct @theinstagramexpert I put in caption and use cleaver spacing techniques so they don’t distract from Instagram lesson I teach. Hobbycraftiness23: I put them 8 space after the caption, it looks more clean that way. Farmhouse.knits: So glad you are going to address this issue! Right now I put them 5 dots down below my caption. Thenaturarian: I separate the # with a few emojis or dots at the bottom of my caption. One thing I don’t like is when folks use #tags within their actual #caption. Annoying. However, I like seeing them at the bottom of the caption, because it tells me more about the photo. tashaswayoflifeI add my comments to the caption (after I post/share to FB). I prefer it in the caption in case I want to edit/add anything. I do it like this so it doesn’t look jumbled with the actual caption. 👇🏼 . The_savvy_stylist_sydney: I put my main hashtags in the comments and the one’s relating to the image on the caption. Angelemaire: Very interesting question. I guess the sooner you post #s, the higher will be the level of engagement. I usually post in my captions 😊 But I can see a lot of users who share them as their comment and they do get a high level of engagement too. What is our experiment telling us? It’s good news for you!! Here’s the thing: we used to put hashtags in the comments because it was “neater”. However last year, something happened: our account got shadowbanned (WH-WH-WHAAAT?). After doing some research AND testing things out, we resorted to leaving the hashtags in our caption. We reached more people than usual and our engagement went up. Ah! So since then, we haven’t looked back. Now, we’re not saying that the caption is the best place to put YOUR hashtags – because obviously putting hashtags in the comments seem to work for a LOT of people. We think you need to test it yourself (sorry! It’s probably not the answer you were hoping for, but there’s no point starting new hashtag rumors). Try for a week to put your hashtags in the comments and analyze what’s going on (more likes? Comments? Engagement? Followers?). If both of these options work out for you: choose the one you prefer. Don’t stress out about where to put your hashtags because it doesn’t seem like there is a “right” or “wrong” way. We’ll let you know if we find new information about this hashtag debate. If you find more evidence, or want to share YOUR experience, please share it in the comments below.